Do GCM’s (sic) predict the climate… or macroweather? Ask Lovejoy et. al, in a paper submitted to Earth System Science Dynamics Discussions, and pointed out to Better Figures by the unholy trio of Richard Betts, Ed Hawkins and John Kennedy. I don’t really want to comment too much on the science here, as that might be better done at the open and interactive review of the submitted paper. The basic idea of the paper is that when compared with observations, climate models don’t reproduce the long-timescale behaviour of the Earth system. This is an important point, raising questions about whether the models give us any useful information about the climate in the long term, and at the large scale. So, the answer to the question posed by the paper title is of course “perhaps”, although it really is quite difficult to tell from the figures. We start out well, with a nice clear monochrome timeseries plot in figure 1.
and climate regimes (reflected in their scaling exponents). And figure 2 is clear enough, although I think those trend lines are too leading to the eye – just presenting the data, or greying out the trend lines might be better. Fig. 2. A composite temperature spectrum: the GRIP (Summit) ice core δ 18 O a temperature proxy, low resolution (left, brown) along with the first 91 kyr at high resolution (left, green),◦ with the spectrum of the (mean) 75 N 20th Century reanalysis temperature spectrum, at 6 h resolution, from 1871–2008, at 700 mb (right). The overlap (from 10–138 yr scales) is used for calibrating the former (moving them vertically on the log-log plot). All spectra are averaged over logarithmically spaced bins, ten per order of magnitude in frequency. Three regimes are shown corresponding to the weather regime with βw = 2 (the diurnal variation and subharmonic at 12 h are visible at the extreme right). 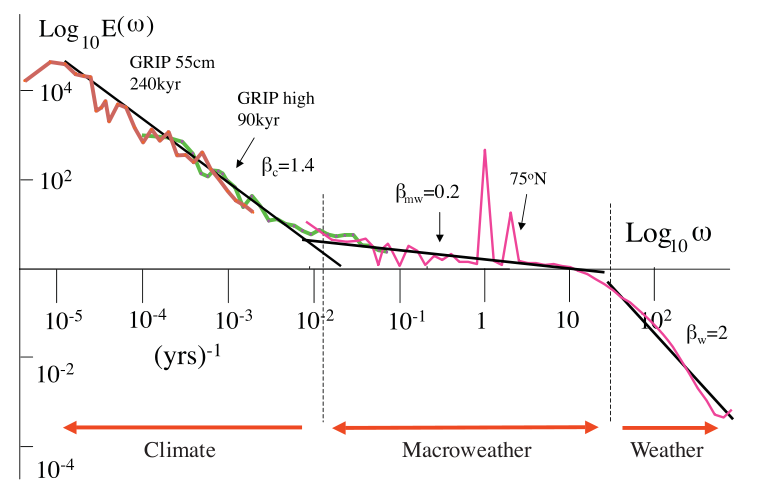 The central macro weather “plateau” is shown along with the theoretically predicted βmw = 0.2–0.4 regime. Finally, at longer time scales (the left), a new scaling climate regime with exponent βc ≈ 1.4 continues to about 100 kyr. Reproduced from Lovejoy and Schertzer (2012d). The black lines are reference lines with the (absolute) slopes indicated. By the time we get to one of the key figures (figure 4), things have changed. Fig. 4. Control runs versus data: a comparison of the RMS Haar structure functions (S(∆t)) for temperatures from instrumental (data, daily 20CR, blue; monthly surface series, red), multiproxies (post 2003, yearly resolution, green) GCM control runs (brown thick, monthly) and the FIF stochastic model (brown thin). The data are averaged over hemispheric or global scales (except for the 20CR 2◦ × 2◦ grid scale curve which was added for reference). The surface curve is the mean of three surface series (NASA GISS, NOAA CDC and HADCRUT3, all 1881–2008), the 20CR curves are from the 700 mb level, 1871–2008. The multiproxies are means from three post-2003 reconstructions (Huang, 2004; Moberg et al., 2005; Ljundqvist, 2010): two curves are shown, the top from 1500–1980, the bottom from 1500–1900 showing the effect of the 20th century data; see Lovejoy and Schertzer (2012d) for data references and discussion. The y axis 2 1/2 values 0.5, −0.5 are the log10 <∆T > values. The IPSL curve is from a 500 yr control run, the EFS is from a 3000 yr control run; the “bump” at 2–4 yr is a broad quasi periodic model artefact. The reference lines have slopes ξ(2)/2 so that β = 1 + ξ(2) = 0.2, 0.4, 1.8. The amplitude of the Haar structure functions have been calibrated using standard and tendency structure functions and are accurate to within ± 25 %. 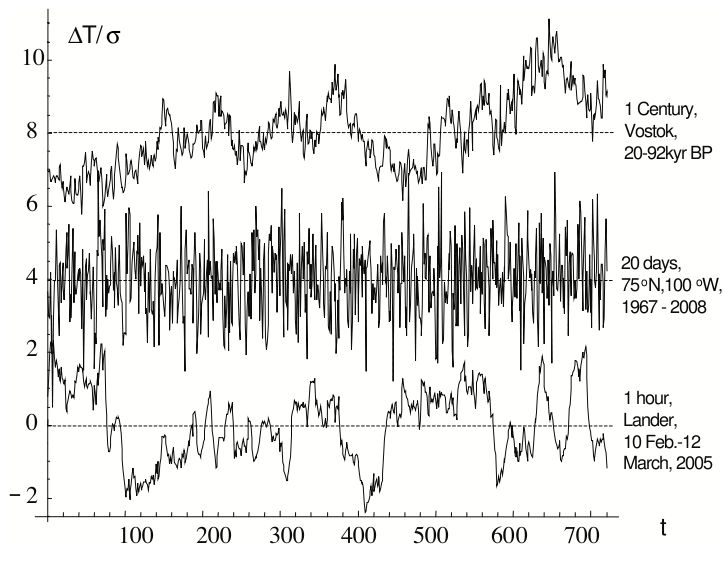 At the upper right we have sketched the Vostok and GRIP paleotemperature S(∆t) curves (see Fig. 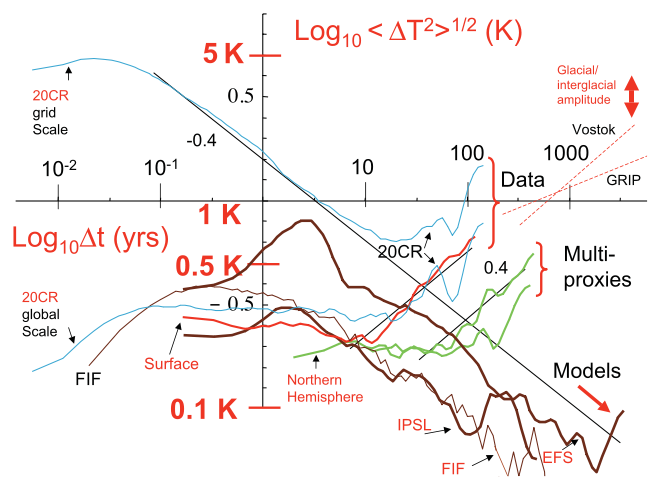 3) and have indicated the likely glacial/interglacial mean temperature range (difference) by the arrows. Crikey, that’s a lot of information to put on one figure. And by the time I’ve waded through another 5 (count ’em) superficially similar figures, I’m drowning. This is a shame, because the graphics in this paper actually have a lot to recommend them. For example, I like the colour palettes for the lines, and that those lines are directly labelled. I think the problem is that, given so much information, it is really hard to pull the main claim of the paper (the difference between the observations and model behaviour) out from the melee. There are simply too many lines, too many labels, and too many plots to distinguish the important from the unimportant. The axes labels of this graph can’t be understood without referring to the text; in fact, it appears that the y-axis has two scales. Another bunch of eye-leading trend lines have turned up, along with some that refer to a previous figure (‘Vostock’ and ‘GRIP’). I might be tempted to make all data labels a single colour, in order to distinguish them from the actual data. Science is complex sometimes, and I expect to have to do some work to understand a paper, but it shouldn’t feel this hard. I’m all for shock and awe, but I think that these figures try to do too much, and end up failing at doing any one thing effectively. If I were to try and neaten things up, I’d start by removing the straight lines overlain on the data. I’d also get rid of the heavy red axis labels. I’d colour code the labels for each line so that it is immediately obvious which label corresponds to which line. There also seem to be too many labels with some lines labelled twice. I’d shif the axes to the outside of the plot so they don’t intersect all the other lines and make sure they cover the full range.